When I had kids I vowed never to impose the standard Filipino expectations on them to follow a career in the medical field. In the deep recesses of my heart I knew I didn't have it in me to be a nurse so I compromised with my parents and ventured into the pharmacy field. It wasn't my calling; nor was it a passion. It was a necessity. 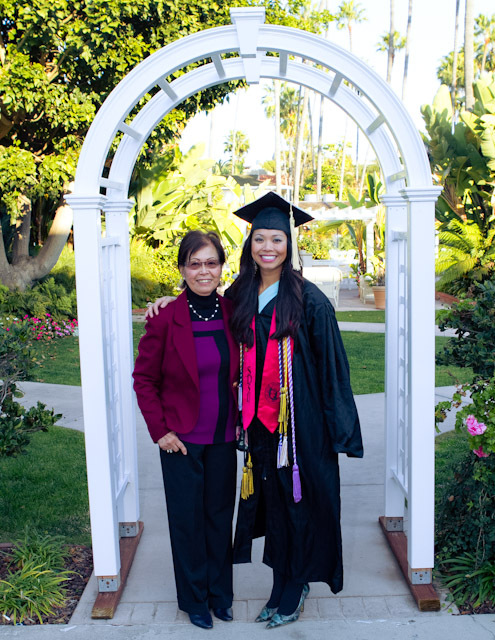 Imagine my surprise five years ago when my oldest daughter, Maricelle, announced that she was accepted into San Diego State University and was pursuing a career in nursing. More power to her, I thought. I looked forward to her leaving home for college because it would give us a much-awaited respite from each other. Her four years in high school were tumultuous ones with each of us viewing the other as an annoyance. But I was secretly shocked when I felt the gnawing pain of impending loss after we dropped her off at her first apartment adjacent to the SDSU campus. 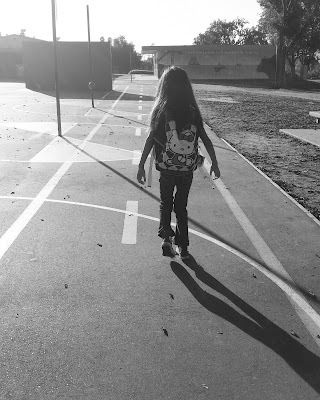 For two weeks afterward I was a depressed, miserable mess and it was a revealing time for me as a mom: I wasn't the hard a$$ I thought I was and missed her terribly. Last week, Maricelle graduated from the SDSU nursing program and the magnitude of my pride in her is inexpressible. The last 5 years have consisted of many tear-filled, anxiety-ridden, emotionally-charged phone calls from her at any time of day (or night). I've watched her maturity slowly unfold like the delicate petals of a rosebud. She would describe her experiences during nursing rotations and internships while I made sure my impulse to gag/vomit wasn't blatantly obvious. I received many requests to proofread essays, letters, and speeches. We familiarized ourselves with the Amtrak schedules, looked forward to picking her up when she came home to visit, and battled melancholy when we dropped her off to head back to college. 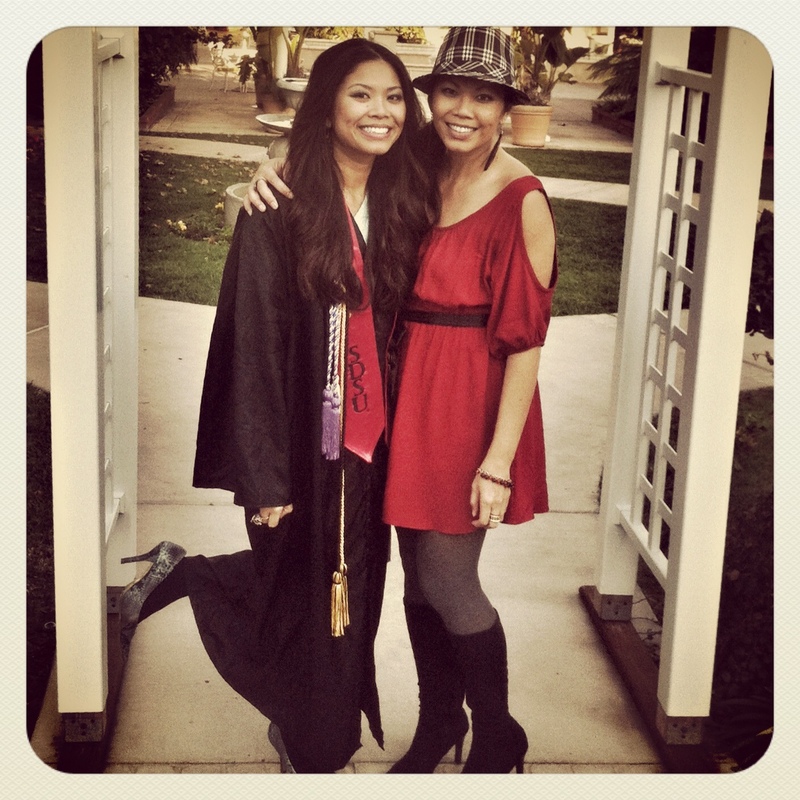 Through my daughter I was able to experience the college life I shunned and scorned. It was only a few days after her graduation when Maricelle's true mettle as a nurse was put on display. 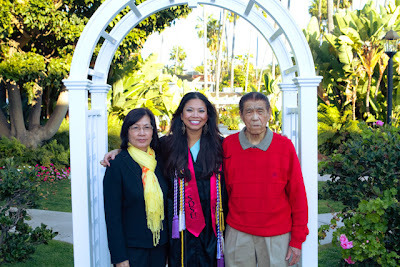 We received news that my aunt in San Diego suffered a massive stroke with internal bleeding. After a flurry of phone calls and text messages I found myself playing chauffer as I drove my parents, aunt, and uncle to San Diego late Friday night. I watched as Maricelle asked the nurses questions about the type of stroke my aunt suffered and the words "subarachnoid" and "intercranial" scrambled my brain. She truly is gifted and meant to live life as a nurse which is obviously her calling. In between my desperate prayers of healing for my aunt, I sent a prayer of gratitude for my daughter who wouldn't have to live a life of mediocrity working a job she isn't passionate about. Maricelle possesses the courage to take the leap of faith necessary to pursue her dreams. It is a solid bravery that I never had at her age. The night of Maricelle's graduation my sister reminded me about the time 24 years ago when I discovered I was pregnant at 19-years-old and decided to keep the baby despite the hailstorm of opposition I faced from my family. For all the parents, especially the single mothers, I would like to encourage you to NEVER give up on your children and to cover them with a quilt woven of prayers, love, and blessings. Even when times are dark and both of you view the other as nemeses I can assure you of the indomitable bond borne out of that darkness. And I can guarantee that at the end of that tunnel of blackness is a radiant, piercingly bright light and we, my daughter and I, are living proof of its glory. I am giving my parents, Sally and Eddie, and Maricelle's other grandma, Fe, public recognition and bottomless gratitude for their unconditional love and selfless sacrifices. Maricelle wouldn't be where she is today without them.